Can you distinguish a Crack Shack from a million dollar Vancouver Mansion? What will $1 million buy in Vancouver, Canada - A Crack Shack or a Mansion? I got 10 out of 16 correct. 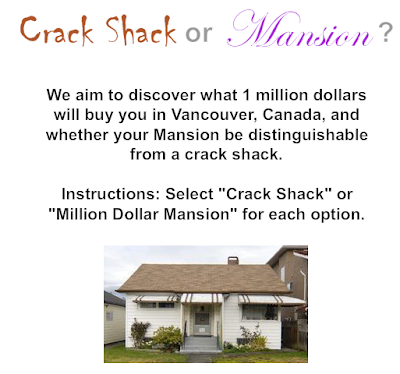 Please click here to play Vancouver Crack Shack Or Mansion. The number of re-sale houses on the market in Canada hit a record in March, with the new supply helping ease price pressures in the market, the Canadian Real Estate Association said. Some 97,663 properties were listed for sale on the Multiple Listing Service in March, that’s 20% higher than the previous March record set in 2008, CREA said. A total of 233,402 new listings have come on stream since the beginning of the year, and that’s more than any other first quarter on record, it said. The association said that while demand remains strong, there are signs the market is cooling off from the record-setting pace of the fourth quarter. That is exactly how the bust started in the US: record units for sale with demand still strong. A few short months later demand collapsed while supply soared.